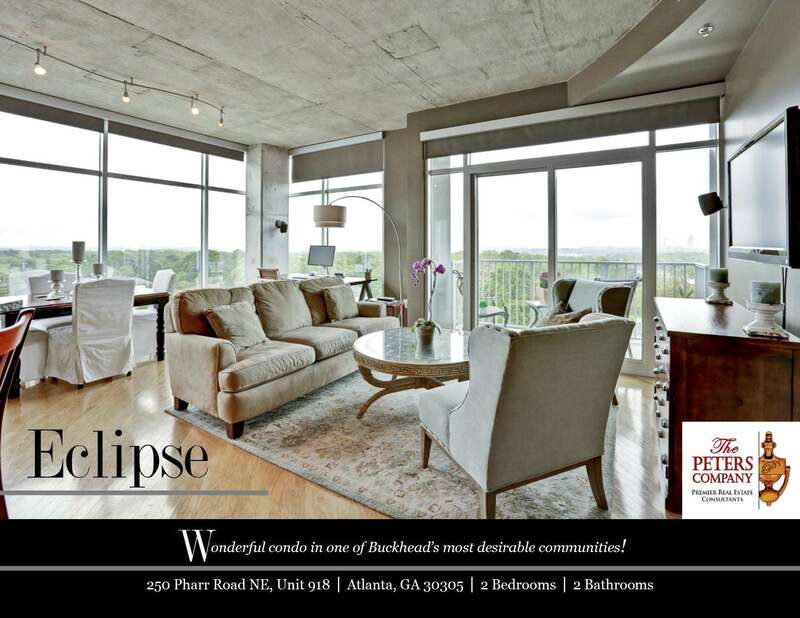 Just Listed :: Corner Unit Condo in Buckhead's Eclipse! Welcome home to this wonderful two bedroom, two bathroom corner unit condominium on the 9th floor of Buckhead’s private and highly sought-after Eclipse building. Convenient to Buckhead’s finest attractions, you will be in the middle of it all including prestigious shopping, award-winning restaurants, and exciting nightlife. Easy access to I-85, I-75, GA400, and Peachtree Road make virtually all commutes a breeze. · Located in a gated community with 24/7 concierge service. · Kitchen features stainless steel appliances, granite counters, and island with breakfast bar. · The main living area is accented by hardwood floors, floor to ceiling windows, and includes a nice combination of living room and dining area which are perfect for entertaining. · Master suite is complete with a walk-in closet and bathroom with granite vanity, garden tub, and separate shower. · Secondary bedroom with walk-in closet and attached bathroom is well-sized and bright. · Balcony provides additional living and lounging space with great city skyline views. · Largest floor plan in building! Unit also comes with two deeded parking spaces and a spacious storage unit. · Additional amenities include secure access between floors, a well-maintained pool, fitness center, and clubhouse with catering kitchen, pool table, and media room. · Great location close to interstates, shopping, and restaurants. ← How do Buyers Find Homes for Sale?